Few market segments are quite like the automotive industry, as you can basically separate your values and desires from your model by region of production. For those looking for intrepid, strong durability, you'll likely be drawn to American automakers. If you want efficiency, convenience, and innovation, an Asian model might be more your speed. But for all of these plus a little added luxury and refinement to boot, look no further than what Europe has to offer. Two of the biggest players from the European market come from Alfa Romeo and Audi, representatives from Italy and Germany, respectively. These two rivals outdo each other every year with what they're able to bring to the table. 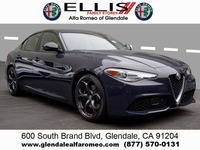 Our Alfa Romeo of Glendale team has compared our top performers against the Audi family, so come in and see how they match up! Vehicles like the Alfa Romeo Giulia and Stelvio can match up quite well against their Audi competition, as their base 2.0-liter twin-turbocharged engines can produce 280 horsepower, greater than the 252-horsepower offered by the Audi A4. Add an available upgrade to Giulia and Stelvio Quadrifoglio trims, and there's really no comparison, thanks to 505 horsepower and blazing fast 0-60 times. Add this to Q4 All-Wheel Drive capability, and nothing keeps you centered and secure on the road quite like Alfa Romeo. The Alfa Romeo family is unrivaled in its available driver assistance packages, featuring top-tier innovations such as Collision Warning, Lane Departure Warning and Adaptive Cruise Control that Audi models have in very limited supply. Plus, with ultra-comfortable leather seating, the Giulia, Stelvio and 4C models are capable of giving you a comfortable, convenient and connected driving experience that the rest of the industry can't equal. As a dealership, we can only say so much – it's time for the critics to do their talking, and they've spoken. The 2018 Alfa Romeo Giulia was named Motor Trend's 2018 Car of the Year, an accolade that can't be matched by the Audi family. In addition, all Alfa Romeo vehicles have achieved high NHTSA safety ratings, while only some in the Audi line have been able to claim this. From inside to out, the choice is clear; for every goal and every desire, an Alfa Romeo model will never steer you wrong!